“Just do it!” was the command from my long-suffering adult daughter. After discussing my planned blog with her for an eternity, she was understandably a little frustrated by my procrastination. To partly appease her and partly conquer my fear of public writing, I finally put my two pointer fingers to the keyboard to compose my first blog post. Since my memory is on a permanent sabbatical these days, it is best I begin with the most recent hike I did in September. My dear daughter, who people mistakenly perceive as a fragile flower, accompanied me and will be referred to as the Tough Cookie that she really is. Before I launch into my first long-winded tale, I must mention one of my favourite words, waldeinsamkeit. It’s German and means “solitude in the forest,” but not in a negative, lonely way. To an introvert like me, the feeling of being alone with my own thoughts in nature is pure bliss. I also like the Japanese practice of Shinrinyoku, which means “forest bathing”. It basically means spending time in nature to reduce stress, relax and promote a healthy immune system. Back to the walk now. I’ve actually completed this track twice but the first time was in cold weather and fairly uneventful. The second walk with my daughter was certainly more memorable mainly due to it being spring. I’ve used a few pics of the flora and fauna from my first walk to add to this post though. 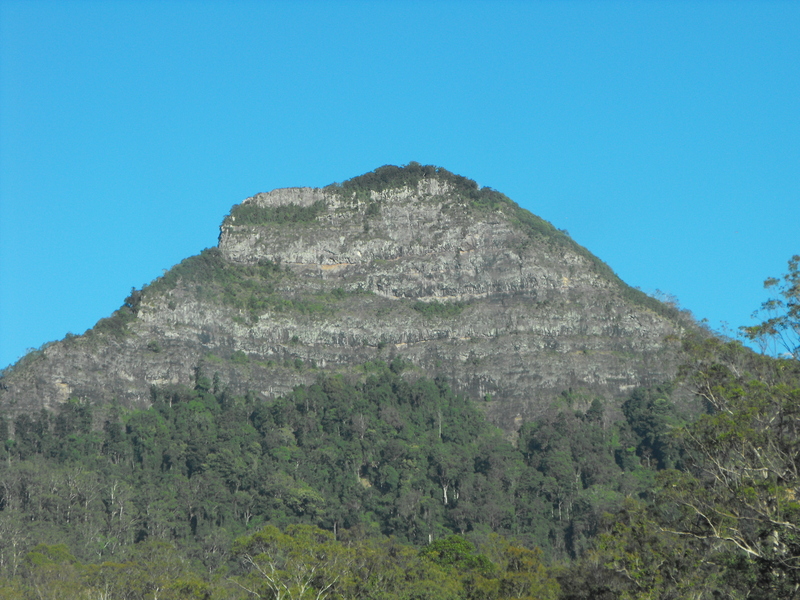 Mt Mitchell is actually a twin-peaked volcanic mountain with an elevation of 1175m and is about 100km west of Brisbane, south of Cunningham’s Gap in Queensland. The class 4 (Australian Standard) 10.2km return walk ends at the eastern peak, known as Cooyinnirra by the Indigenous Yugarabul people. It’s a perilous knife-edge ridge above a sheer cliff, and the almost 360 degree views are spectacular. If you are super fit and like getting from A – B as fast as possible, you could possibly do it in 2 hours. I like to take pics and I’m a day-dreamy nature lover who enjoys her food, so I usually take longer than the estimated time. National Parks recommend 3- 3 ½ hours as a general guide for walkers.